These are the people that start your journey at Southern Cross Vet. They all believe that using their smarts alongside their hearts is important as we know how stressful and scary a visit to a vet may be. Each of our Doctors have a special interest, so reception will endeavour to book you in with the most appropriate Doctor for the species or condition you are visiting us for. Remember that you can always request the same Doctor as they become partners in your pet’s care. Chartered member of the Australian Veterinary Assoc. Dr Sam followed his dream of becoming a veterinary surgeon that began at age three. Since that time, he has developed a strong interest in oncology, internal medicine and animal behaviour. Now a Chartered Member of the Australian Veterinary Association, Dr Sam continues his passion of providing the most up-to-date care to his patients and their two-legged family. 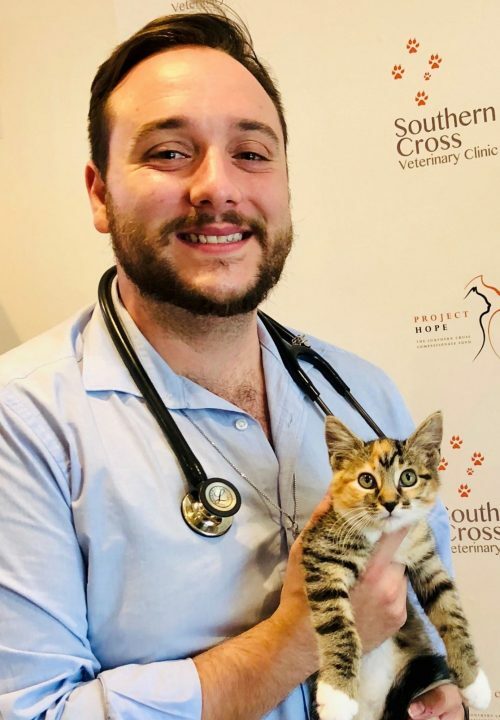 Sam founded Southern Cross Vet in the heart of St Peters, bordering on Alexandria to the west, Marrickville to the east and Newtown to the north, to offer pet parents a new level of service but with reasonable fees. 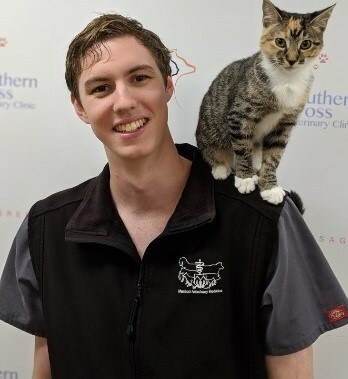 Dr. Michael joined the team in early 2019 after studying Veterinary Medicine at the University of Sydney before which he completed a Graduate Certificate in Veterinary Studies focussing on wildlife health and population management. He has a science background having majored in immunology and microbiology and has worked as a medical scientist at a number of research institutions in Sydney including the Centenary Institute of Cancer Medicine and Cell Biology and the Heart Research Institute. He has a particular interest in all things pathology, both clinical and anatomic, as well as internal medicine, dermatology, oncology, ophthalmology, exotic and wildlife medicine and aquatic medicine, and would be delighted to see your scaly, feathered and slimy friends. In his free time, Dr. Michael loves to spend quality time with his beautiful wife Renee, family and friends. He enjoys relaxing by the coast and is an avid snorkeler who considers himself somewhat of an amateur marine biologist. He fills up his free time with bush walks, loves cooking up a storm, gardening, singing and caring for his tropical freshwater and marine fish and invertebrates, tree frogs and his cheeky feline son Chartreuse. Born in New Zealand but growing up in Perth WA, Dr. Ben graduated from Murdoch University in 2013. Since graduation he has worked in Adelaide, rural Victoria, Tasmania, Perth and finally Sydney, splitting his time between general practice and emergency work. His main areas of interest are both soft tissue and orthopaedic surgery and is passionate about furthering Dr. Sam’s work in making minimally invasive procedures more available to his patients. In his spare time, Dr. Ben enjoys cycling, reading, and drinking wine. He has 2 pets, a moderately overweight cat named Couscous and an Alexandrian parrot called Geoffrey. 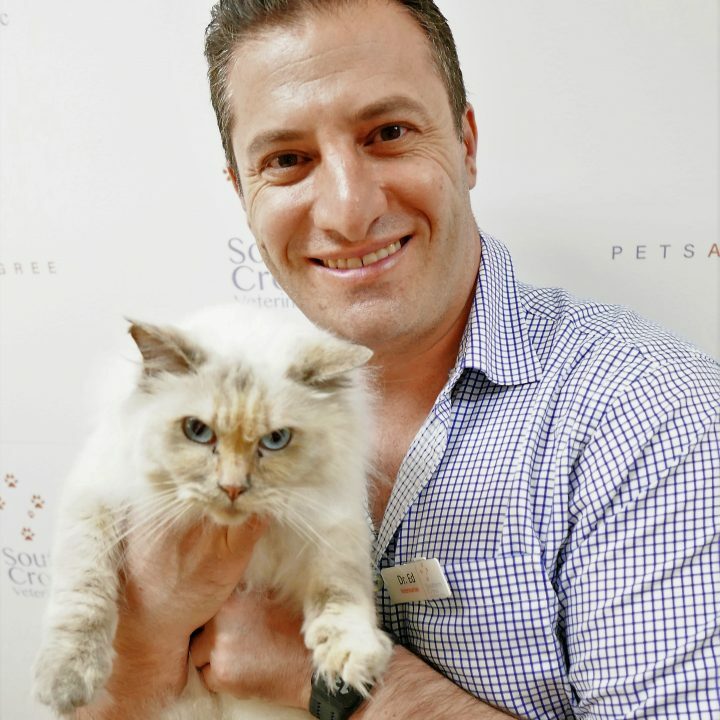 Having grown up and schooled in the Inner west of Sydney, Dr Ed studied a Bachelor of Veterinary Science at Sydney University, graduating with second-class honors in 1997. Since then Dr Ed has worked exclusively in small animal practices all over Sydney as well as the South Coast of New South Wales. With over 20 years experience and an ongoing enthusiasm for all areas of small animal practice, Dr Ed’s main areas of interest are Small animal surgery ( including Orthopaedics and complex reconstructive surgeries), Dermatology, Dentistry, Internal medicine and Imaging. Dr Ed was admitted to the Australian and New Zealand College of Veterinary Science in 2005 after successfully completing the examinations of the surgery chapter of the college. Since then Dr Ed has attended many workshops, especially in Orthopaedic Surgery and Dentistry, to stay abreast of latest developments in the profession and help achieve the best possible clinical outcomes for our patients. In his spare time, Dr Ed is an avid runner, gym goer, and family man. He spends many weekends at the family farm tending a menagerie of various four-legged and feathered critters. Dr Ed enjoys using his experience to work with the great team at Southern Cross vets and serving the community of the inner west and beyond. 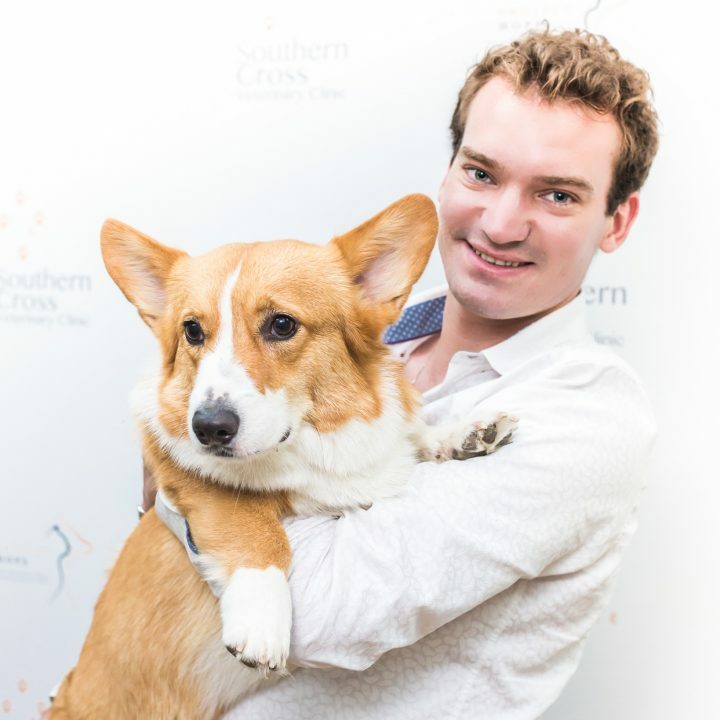 Dr John joined the Southern Cross Veterinary Clinic team in early 2019 after moving from Perth, Western Australia. DrJohn completed his veterinary training at Murdoch University, after which he completed a small animal rotating internship at Perth Veterinary Specialists before making the move to Sydney. His main interests in veterinary medicine are small animal internal medicine, neurology, diagnostic imaging and oncology. Dr John enjoys both canine and feline medicine, and in the future hopes to work towards specialist accreditation within the facets of small animal medicine. 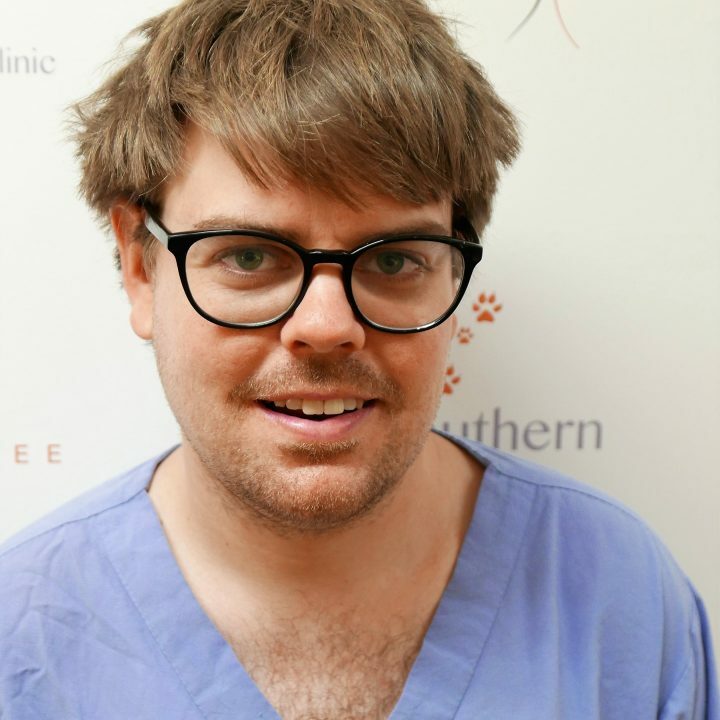 In his spare time, Dr John enjoys spending time with his [slightly chunky] Border Collie “Beau”, hiking, spending time eating and drinking beer with friends, hanging out with his partner and exploring Sydney. Dr Graeme Allen brings a wealth of diagnostic imaging experience to our clinic. He reads and reports CT images and x-rays as well as undertaking interventional procedures such as ultrasound guided biopsies of suspicious looking masses. He became one of the first qualified specialists in Australia and for the past 10 years has also acted as an Adjunct Professor at the University of Sydney. He conducts undergraduate lectures in radiology and many postgraduate courses. Dr Hannan is the newest member of our team. He completed his Bachelor of Veterinary Science at the University of Sydney and then obtained a PhD in canine knee surgery. He currently lectures undergraduate students at the University of Sydney. Dr Hannan performs complex orthopaedic and soft tissue surgery at the clinic and is well known in the veterinary community for his surgical excellence. Dr Levien is double board certified by the American College of Vet Surgeons and the European College of Vet Surgeons which means he can practice high-level surgery in all of Europe, the USA and Australia. He is highly specialised, but has a warm approach to difficult cases. He is one of the only specialist surgeons in Sydney to perform Total Hip Replacements, arthroscopy and Spinal Surgery so is a perfect fit for Southern Cross Vet as we approach the pinnacle of veterinary medicine and surgery. If your pet requires serious orthopaedic surgery, we will call on Dr Levien! Dr Pease is a board certified specialist in veterinary radiology and a champion of veterinary education for over 15 years. Tony Pease graduated from the Virginia-Maryland Regional College of Veterinary Medicine. He has also completed an internship in Large Animal Medicine and Surgery at the Marion DuPont Equine Medical Center in Virginia. Further to this, Dr Pease has completed a Small Animal Internship at Affiliated Veterinary Specialists in Maitland, Florida. Tony has also completed a residency in Diagnostic Imaging at Cornell University. Tony is currently the Chief Veterinary Medical Officer of Western Veterinary Conference, one of the USAs largest Continuing Education events for vets. He was previously president of the American College of Veterinary Radiologists, the organisation that registers specialist vet radiologists to practice. Dr Pease has lectured internationally on diagnostic imaging with a focus on radiography and ultrasound. In his spare time, Tony enjoys Ice Hockey and competing in triathlons.